There are two types of training: behavioral and obedience. Behavioral training prevents and or corrects bad habits that your puppy or dog may develop or already has developed. Jumping, car chasing, begging, climbing on furniture, and chewing are just a few. It is very important to be consistent during the training process. For example, do not let your puppy on the couch unless you are planning to allow it on the couch when it is full grown. This will confuse it, causing problems. Taking the time to learn natural dog behavior and satisfying the dog's natural instincts along with proper exercise will help you communicate to your dog and can mean the difference between success and failure. Some of the specific commands are "sit," "stay," "come," "down" and "heel. "When speaking the commands, say them loudly and clearly, repeating them often. The dog may have to hear the commands over and over, but will soon begin to associate the word with its meaning. Always remember to praise your dog when it responds correctly. This will encourage your dog to perform correctly the next time. You may either use food, or affection such as a belly rub, a pet or verbal praise as the reward or both. 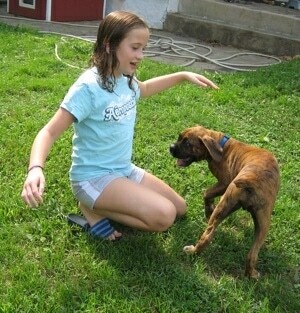 A lot of puppy and dog training classes teach the heel command only in the advanced classes. The heel command should actually be one of the first things you teach your puppy or dog. They need to learn how to follow. Once you establish this all other aspects of training will be easier and their behavior in general will be better as the dog will learn to respect you as the leader. When teaching your dog to sit, hold your hand high over its head with a reward in it. Your dog will look up at the reward. Use your other hand to gently push the dog's behind into a sitting position, and say in a clear, firm tone, "SIT" while still holding the reward in the air above the dog's head. When your dog sits, give him the treat and verbally praise him. Do not allow your dog to jump up and grab the reward out of your hand. Say firmly, "NO." You will have to repeat this over and over. Eventually your dog will associate sitting with the reward and will sit without your assistance. Remember the training sessions should be short but frequent. Repeat this method periodically throughout the day. If you get frustrated, stop and try again later. 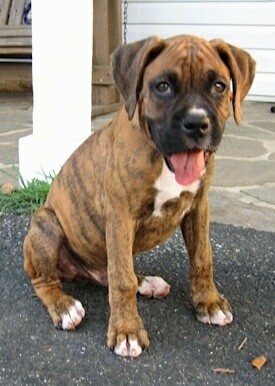 Video – Bruno the Boxer Puppy Learns To Sit. It is usually best to teach your dog to sit before you teach it to stay. The reason is your dog will have an easier time staying if it is in a sitting position. After your dog has the sitting command down, and has been correctly sitting for a couple of days without assistance, it is time to teach your dog to stay and come. Tell your dog to sit. Have two rewards in your hand. After your dog sits, give it one of the rewards. Hold your empty hand up like a stop sign in front of your dog's face and back up slowly saying "STAY" clearly and firmly. Be sure to stay facing your dog and remain looking at him. Go a short distance and say with some enthusiasm, "COME." When your dog comes to you reward him again. If your dog gets up and runs to you without the "COME" command, say "NO" and start all over again. Remember to verbally praise as well as provide a food reward when he gets a new command correct. Start off only backing up a short distance from your dog. As he begins to understand what you want of him, you may back farther away and eventually you may be able to walk out of sight and have your dog still stay until he hears the "COME" command. Remember to be consistent and stop if you become frustrated. Your dog can sense frustration and it will confuse him. They want to please you. If they sense your frustration, they may learn to dislike the training sessions as they associate them with a negative feeling coming from you. Video – Teach a puppy the "Stay" and "Come" command. After successfully teaching your dog to sit, stay, and come—without assistance, it's time to teach him to lie down on command. Tell your dog to sit. Show him the reward you have in your hand. 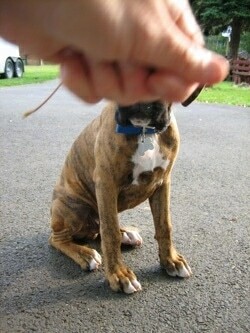 Hold the reward up and then bring it down in front of the dog to the floor and say "DOWN" in a firm clear voice. Only give the reward if he lies down to reach it. Do not give it to him if he stands up to reach the reward. Again repeat this throughout the day as much as possible, keeping sessions short and frequent. Each training session should include any new commands you are trying as well as old commands the dog has already learned—so the dog does not forget them. Always be consistent. Important: If you become frustrated, stop and try again later. Staying positive and taking the time to play with your dog during sessions will teach him that following commands is happy and rewarding. Tips on teaching your dog to heel. Note: A puppy/dog that goes on daily pack walks is easier to train as it will be calmer and less anxious.